Please note that the pattern uses Debbie Bliss Rialto DK in shades: White and Pale Pink. An alternative yarn has been substituted, please complete a tension swatch. A length of Beige DK yarn is required for embroidery. Please note that the pattern uses Debbie Bliss Rialto DK in shades: White and Duck Egg. An alternative yarn has been substituted, please complete a tension swatch. A length of Beige DK yarn is required for embroidery. 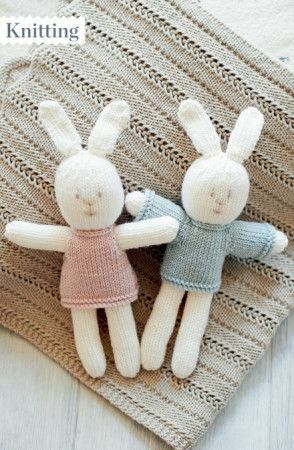 Any little one will adore cuddling these knitted bunny boy and girl toys. They're made using an easy-to-follow knitting pattern for beginners.